With a Russian/Dutch heart: Bills that could give you a heartattack LOL! Good morning Kyra. I have to agree with Jan that all our medicines should be paid for by the insurance. Our country gives so much expensive medicines away free to other countries and to all the illegals who keep coming into the country, and yet the rest of us are desperately trying our best to pay the wicked high prices that we are being charged for these very same medicines. We pay taxes and insurance our whole life, so it seems only fair that the insurance cover the cost for all our medicines. Later today and tonight and tomorrow we are expecting more snow then some rain. Gosh!!! Today is supposed to be Spring. No point in ranting. What will be will be. I think I'll try to finish up this newest afghan today before it is time to go food shopping later with Joe. First though, I need to find something tasty for Pogo and me to have for lunch. I hope the sun comes out soon in your area. I can't wait to see what is growing in your garden. I sympathize with you on the medicines. I've got a sizeable bill with the VA that is getting harder to pay. I keep paying what I can and they are happy with that. Some day I'll pay them off or actually get a new medical card and force them to rebill everything back to 2009. That should fix it all. Just keep a good outlook and you'll make it through! Hope Jan is feeling better. Thanks to Arlene for the pretty cluster & frames. thanks so much to both you and Arlene. these are beautiful! I hope the weather improves, and that no more surprise bills come in the mail. those are defintely not fun! Hope the rest of your weekend is enjoyable! It can be really hard sometimes when you get surprise bills. It is hard enough to organise payments for things you know you have to pay for. I hope you and Jan are able to sort it all out. 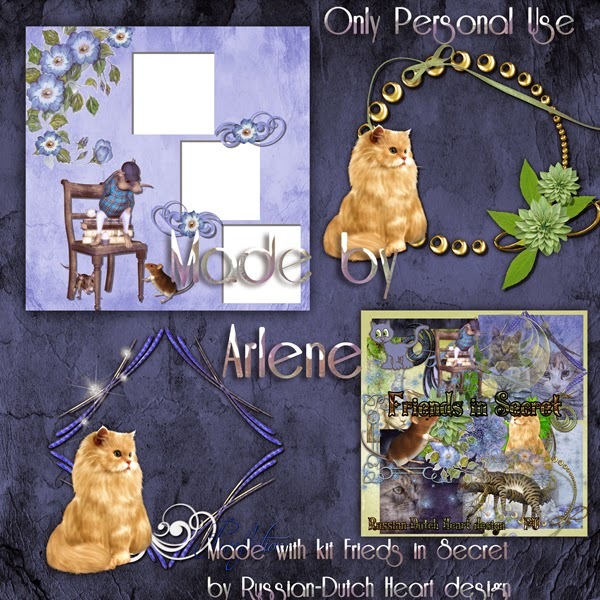 Thank you and Arlene for sharing your lovely kits and clusters with me. :)Love them!! Hoping you and Jan have a marvelous Spring and your garden grows nicely. :)Would love to see the results!! Wow, I have been so remiss in visiting and collecting the beautiful kits and gifts from Arlene, but now I think I am caught up. Got a bit of Spring Fever and had to steam clean my floors and then shine them and dust and vacuum and wash bedding and throw rugs, etc...so I really haven't had time, but the things I do daily just don't clean as deep as I like, but the part time job will end in about 3 weeks so I will have more time....LOL!